They're a key ingredient in our favourite recipes and there are always imported varieties available in the shops. But right now British tomatoes are ripe and ready for eating – discover why they're the best. Watery, tasteless, boring – all words you’ve probably thought when eating the average supermarket tomato. This is because four out of every five tomatoes are imported, meaning they’ve been picked long before they reach your dinner plate. However, from now until the end of summer, British tomatoes are in abundance (and are, in fact, available throughout the rest of the year), offering more variety, flavour and freshness than those from abroad ever could. Tomato growers on the continent aren’t producing poor tomatoes, it’s just that the fruits don’t travel particularly well. Imported varieties tend to be picked when they’re still unripe and green, so they can turn red en route to the UK and arrive with a longer shelf life. This means they’re sitting in a refrigerated lorry at the very time when they should be developing their fresh, perfumed flavour. British tomatoes, on the other hand, don’t need to trek thousands of miles to reach shop shelves; this means they’re left to ripen naturally on the vine before being packed and sold within days. Being grown in greenhouses also means British tomatoes are harvested all over the country, not just in the sunnier parts of southern England. The Isle of Wight, in particular, is known for its tomatoes, thanks to its unique maritime climate, while Yorkshire is home to hundreds of giant greenhouses. You can find locally-grown tomatoes in nearly every region of the UK, all tasting fresher and more flavourful than anything imported from the continent. The way they’re grown: British tomatoes are only picked when they’re perfectly ripe, meaning they’re left attached to the vine for as long as possible to develop extra flavour. They also spend their lives in state-of-the-art greenhouses, which means their environment can be precisely controlled by growers. Temperatures can be regulated and many use advanced environmentally-friendly LED lighting to ensure there’s enough light for plants to grow to their full potential. Tomatoes grown outdoors rely heavily on the weather, which is always unpredictable. The variety available: from sweet and delicate cherry tomatoes to big, bold beefsteaks, British producers are now producing tomatoes in all sorts of shapes and colours, each with their own unique flavours and textures. How they’re harvested: because they’re only picked when they’re ready to eat, British tomatoes don't spend days (or weeks) in refrigerated lorries. Keeping tomatoes at low temperatures for an extended period of time severely affects the final flavour, which is why imported varieties are often so bland. By getting them to shop shelves within days, UK growers are able to retain that fresh, green aroma and home-grown flavour. As you can see, there are plenty of reasons why you should seek out a pack of British tomatoes next time you’re in the shops, and now’s the perfect time of year to enjoy this very seasonal treat. 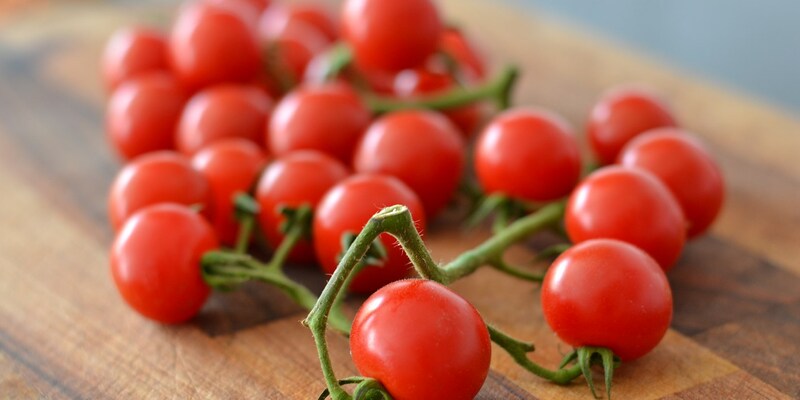 If you’ve fallen out of love with tomatoes, or think they don’t taste like they used to, just see what it says on the packaging – if it’s grown in Britain, then you’ll be buying tomatoes that taste like they should.